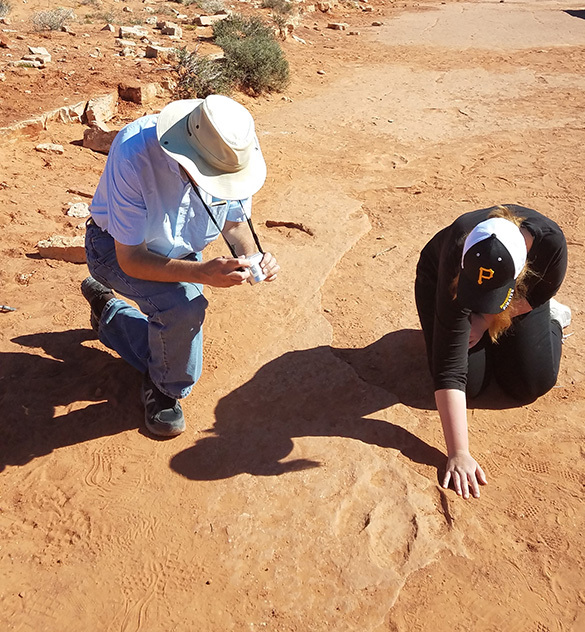 Hurricane, Utah — Team Jurassic Utah finished its fieldwork two days ahead of schedule because I hadn’t calculated just how efficient it is to have Dr. Shelley Judge as a member. Twice as fast, twice as good. 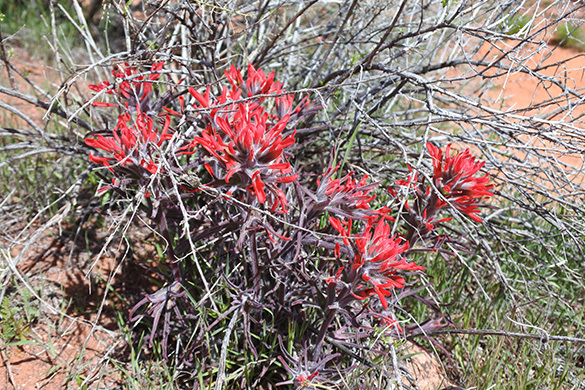 We thus were able to have yesterday in Zion National Park and today in the St. George area. With the perfect weather this was the place to be an exploratory geologist. 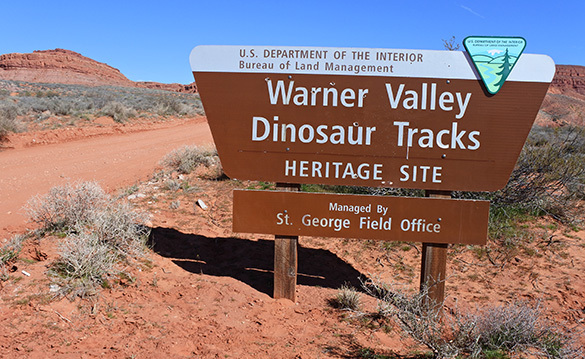 We first drove down a long dirt road to a site in Warner Valley which has exposed Lower Jurassic dinosaur tracks. Here’s the nice footprint. Notice how the mud was squeezed up between the toes as the theropod sloshed its way across a floodplain. 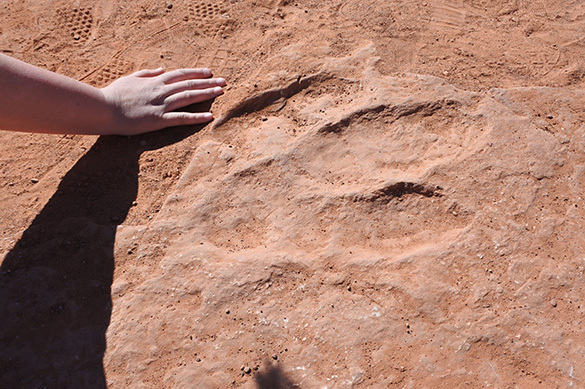 This shape of dinosaur track is given the trace fossil name Eubrontes. 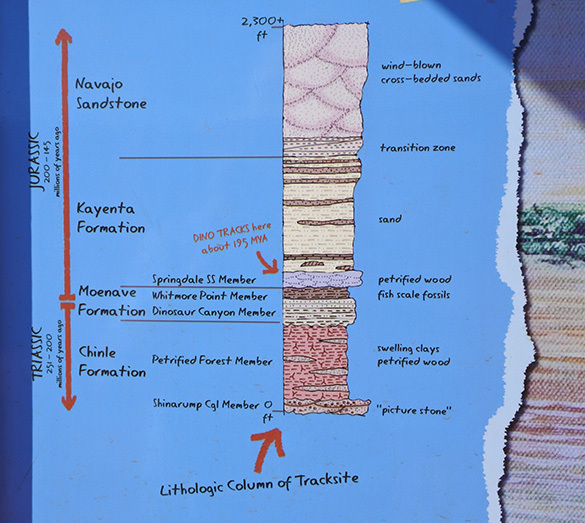 The footprint layer in Warner Valley is in the lower part of the Kayenta Formation (Lower Jurassic). We next visited a beautiful neighborhood in Bloomington which has in its midst an excellent set of Indian petroglyphs. 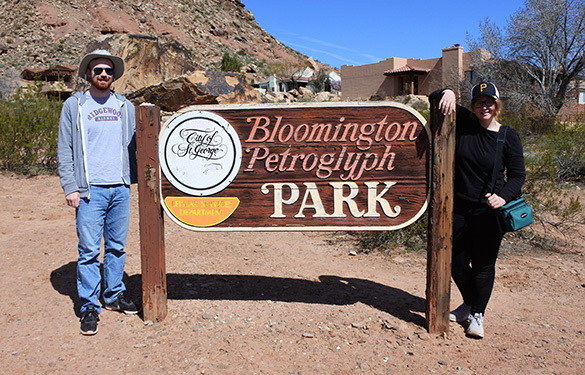 The Bloomington Petroglyph Park is tiny, but well worth the drive. 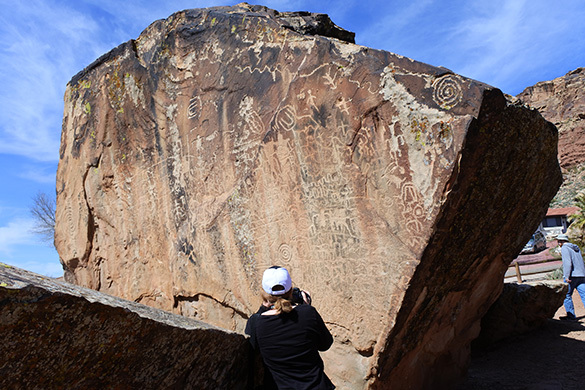 Anna is here photographing the largest surface of petroglyphs. 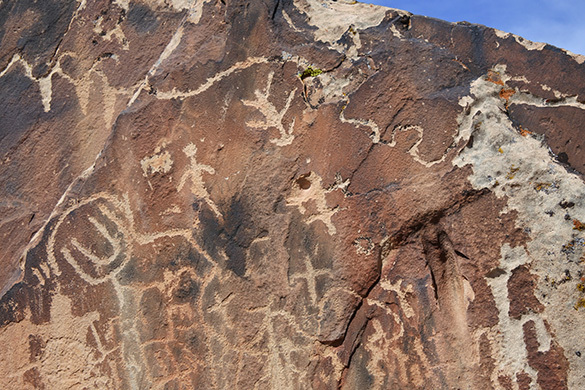 Most of the petroglyphs were made by carefully scraping away a layer of desert varnish on light-colored sandstone blocks. Humans and animals are easily recognizable; other symbols are mysterious. 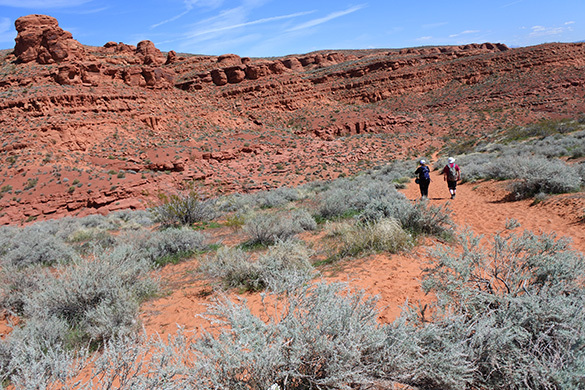 After lunch we went to the Dino Cliffs site in the Red Cliffs Desert Reserve. 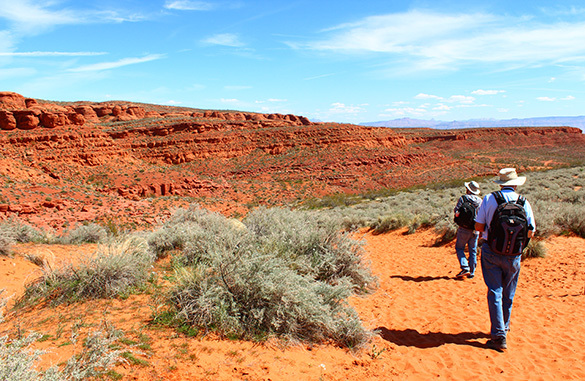 We had a nice hike through exposures of the Kayenta Formation. (The top image of this post is also from this area.) We found the dinosaur tracks, but their poor preservation did not merit a photo. 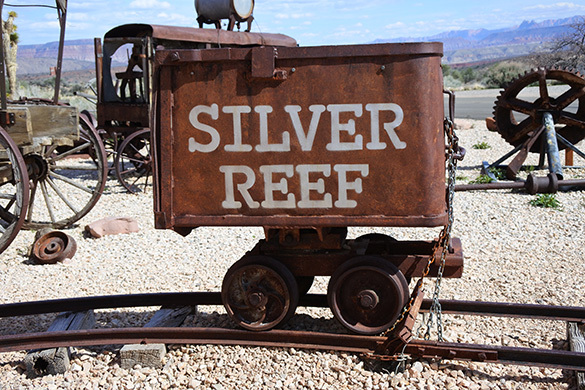 Finally we went to the old 19th century mining town of Silver Reef. The museum was closed, but we were able to walk around the old buildings still preserved, along with antique mining equipment on display. 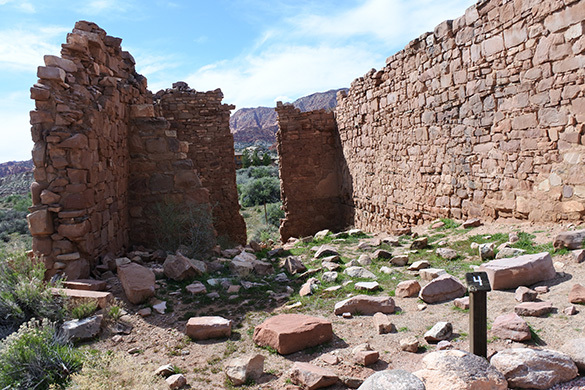 Most of the old town is long gone, leaving some evocative ruins. 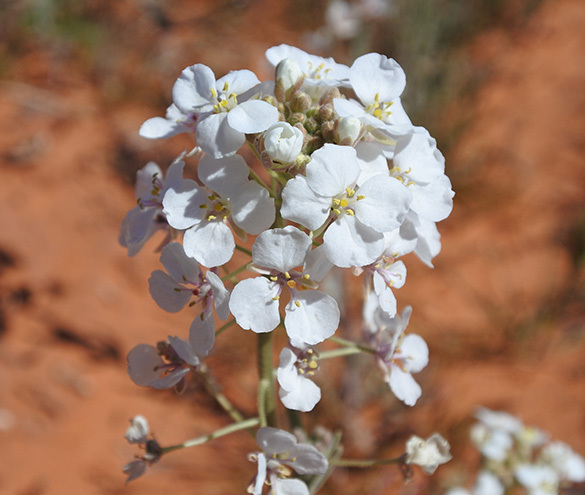 … and significant numbers of Spectacle Pod (Dimorphocarpa wislizeni). Thank you to my Mother Corinne Wilson for the identification!